After 20 years of rocking our garage faces off, Portland Band Dead Moon is rumored to have called it quits. The Weekly Volcano has confirmed such fact, but a reliable source in Olympia says Fred Cole said, "Time to hang it up." 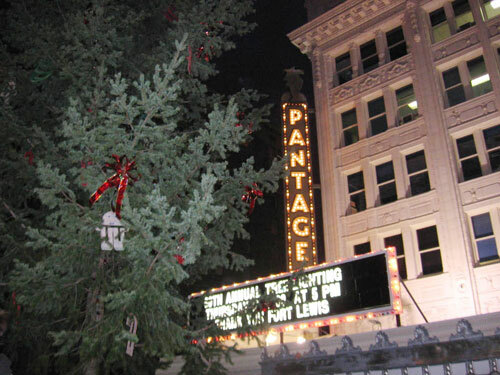 Tacomaâ€™s 60th tree lighting ceremony began small and built steadily, until the newly refurbished lobby at the Pantages was filled Thursday, Nov. 30. There was also a large crowd outside under the tree, waiting for the ceremony to begin, not realizing the festivities were taking place mostly inside. Lack of parade notwithstanding, the crowd was an events-producer pleaser, â€œabout tripleâ€ the size it had been last year. Inside the Pantages lobby, TAGâ€™s Tacky Christmas Sweater Chorale led a sing-along of Christmas carols while sugarplum fairies, toys, snowflakes, and other cast members from the "Nutcracker" mingled with guests. 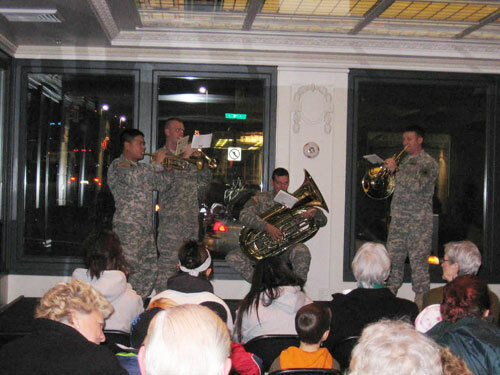 The Fort Lewis I Corps band took the stage, not in tacky Christmas sweaters, and played more carols while visually serving as a reminder of what the event commemorates â€" a long-term link between the military community surrounding Tacoma and the City of Tacoma. Mayor Bill Baarsma spoke next. Saying he wanted to â€œgive credit where credit is due,â€ he talked about the past. In 1946, Mayor Harry P. Cain returned from the war, a decorated veteran, and wanted to create a tie between the Fort Lewis community and the city. Mayor Baarsma acknowledged a similar military tie, that of his sonâ€™s service in Iraq with the Navy. 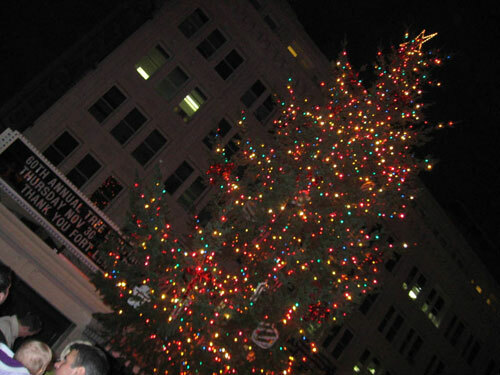 That tie between the supportive Tacoma community and the local military community is still a strong one, and the symbolism of the huge donated tree from Fort Lewis keeps the communities bonded. At some point in the '80s, a friend took me to see a drag show at the Polar Bear. Hot women were afoot, although they were men, and the city was alive, albeit in that scary sort of way. Fast forward to last nightâ€™s fashion show between Rocky and Cocoâ€™s and Dame Lola, when downtown went uptown. Beauty prevailed, flustering a usually suave Volcano lounge rat Brad Allen into admitting, â€œI had to leave early, there were too many beautiful people and I was getting flustered.â€ But, Brad, You ARE beautiful people! Even still, I kind of felt his pain, looking around me at the scorching hot people assembled before me. Fortunately, champers on tap alleviated the ache somewhat, with some crazy-cool tracks laid by DJ Josh Comer making the space oh-so-tangibly-cool. Foremost, the shop owners themselves, Rebecca Dashow and Katy Jayne, dressed to kill in Miguelina and Prada pumps, respectively, drove the beauty of the evening, with adoring partners in tow. While Dashow put her man to work serving champagne, Jayneâ€™s guy sat back and chilled in the still of the night. Crowds milled, loved, and bought clothes, while sipping the bubbly. At Rocky and Cocoâ€™s the models, coiffed by Salon Auberge Du Soleil out of Federal Way, meandered through the crowds, while at Dame Lola, the models perched on sometimes precarious podiums and let us stare adoringly at lovely clothes on beautiful, real people. We contributed $5 to get champagne, goodie-bags, and hors dâ€™oevres, all of which went to a great cause â€" Tacomaâ€™s Fund for Women and Girls. Janet Stanley, enjoying the fun with her daughter Mackenzie, says for the organization, â€œWe promote generosity among women.â€ Cheers to that! Dashowâ€™s models were a collection of her friends and clients; among my favorites were Chelsea, whose birthday wish was to go to a fashion show with her mom. Dashow trumped her wish and put her in one. Also a fave, Jennifer Robbins, of J Robbins Florist fame, sporting a fabulous vintage (Grandma Sally) mink mini-stole clasped with a fabulous broach â€" courtesy of Dashowâ€™s own collection â€" and Rebecca Taylor dress, with the shoes to die for â€" turquoise peep-toe pumps with red soles. On the podium next to Robbins, Trina Jones, photographer extraordinaire, sporting a look she classifies as â€œIâ€™m sort of Bohemian a little bitâ€ with velvet faux shearling coat, a fabulously bright skirt, layers that included my favorite â€œBaked Pop Tartsâ€ tee (go in and see it, and buy it!) and the Piece de Resistance, to me, the (Arrrrg!) pirate boots I bought for myself early in the fall. Jayneâ€™s models flashed flesh, twirled, and sported Diane von Furstenburg, among them were the owner of Salon Auberge Du Soleil, Donna. The Pacific Grill swelled with beautiful people as DJ Josh and a retinue of cool DJ folk including DJ Broam (who also has a glass-blowing day job), and who were later joined by a radiantly fabulous and fur-bedecked Laura Malone. At which point, I knew well and truly, I was outclassed and out way too late, since I, too, have a day job. Good times, good threads, good tunes, good city. Slim Moon has said farewell to Olympia. Moon, the founder of Olympia's Kill Rock Stars label, left the label to his wife, Portia, and now works A&R at Nonesuch Records. The two live New York, making the Olympia-born label bicoastal. Moon just posted a farewell message to Olympia on the Opium message board and signed off the digest. Youâ€™ve heard of Darcy, the newly-sprung Internet knitting celeb first seen on BoingBoing, then blogged on exit133 and GritCity. You wanted to join up with her and the chicks, sticks in hand, for the "Chicks with Sticks" Knitting League of Friends,â€ but have wondered about the time, date, and undisclosed location. Iâ€™m here to dish on that. I met up with Ms. Darcy in her top-secret seclusion spot, under heavy midget-guard and surrounded by art. Sheâ€™s finding herself unable to come out to make her appearance due to scads of cupcake orders that sheâ€™s filling double-handedly. Once Ms. Darcy can work herself out from under the mountains of yarn, the "Chicks with Sticks" Knitting League of Friends will most likely meet up at Kingâ€™s Books, kindly loaned for the purpose by sweet pea, our knight in curly-haired armor. 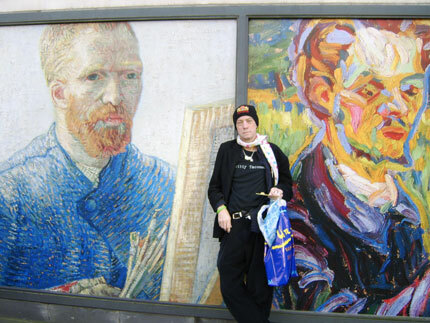 Pictured: teddy Haggarty leaning against the Van Gogh Museum last week in Amsterdam. Photo by Leonard Haggarty.